If you’re looking for a shower enclosure that can serve as the focal point of your bathroom, you can end your search right here. 31-W Insulation installs shower enclosures that can complement the design motif of just about any bathroom, whether it’s bright and contemporary or more subdued and traditional. Made by Quality Enclosures and Coastal Industries, two respected manufacturers of premium glass shower products, our enclosures come in different styles and with a bounty of options to help design a shower space that will take your breath away. Frameless – Because this elegant option lacks metal frames, it can lend your bathroom an airy, expansive feel. Framed – An attractive combination of strength and functionality, this enclosure has strong magnetic seals for years of watertight performance. Semi-frameless – Graced with polished aluminum, this style has the look of sturdy glass that can be a fine design complement for bathrooms in a diverse range of styles. 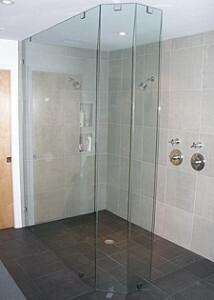 You can customize all of our shower enclosures according to your design preferences. Design options include patterned glass, anodized frame finishes, and door styles in hinged, sliding, and fixed options. During the consultation, our representative can help you choose the options that blend best with your bathroom. To help narrow down this list of wonderful choices, we will measure your shower space and provide you with an estimate. It’s easy to start exploring enclosure styles and options so that you have a good idea of what will meet your budget. Just contact 31-W Insulation and let us schedule a free consultation at your Huntsville home.